MORE COMMENTS on “Twenty-five Anthems” from choir directors. Peter and Mary Alice’s choral arrangements and compositions are being sung by community, church and hospice choirs throughout the U.S. and the UK. 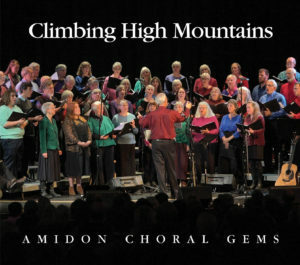 Now the Amidons have published two books and companion sampler CDs of collections of their most popular, musical and accessible arrangements. 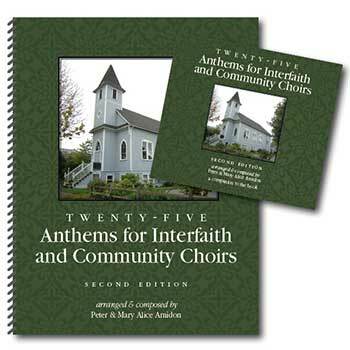 This book “Twenty-Five Anthems for Interfaith and Community Choirs” is geared particularly to UU church choirs. This collection is now in its Second Edition. Click here to see the changes from the First Edition. 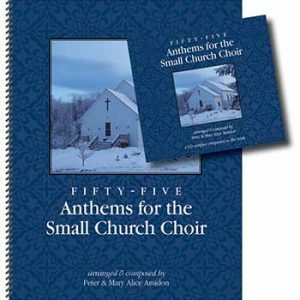 The second book “Fifty-Five Anthems for the Small Church Choir” is geared particularly to choirs in small, mainstream Protestant churches. However, both books are useful to any church, community, high school or hospice choir. Here are the songs included in our “Twenty-five Anthems – 2nd Edition” book and CD. Mary Alice co-arranged “I’m Gonna Lift My Sister Up”, “Give Me Birds at the Dawning”, “My Heart is Ready”, and “How Could Anyone”; and she composed the music to “Still There Is Love”, “Great Trees”, “If I Can Stop One Heart” and “Still There Is Love”. Peter arranged or co-arranged all of the songs.